Sikkim Chief Minister Pawan Chamling inaugurated a passenger ropeway at Namchi in South Sikkim on Monday and dedicated it to the people. The rope is being designed, constructed and operated by Damodar Ropeway and Infra limited. The total cost of Namchi Passenger Ropeway is Rs 43.54 crore of which Rs 14.43 crore is funded by Non-Lapsable Central Pool of Resources [NLCPR] and remaining from the State Plan. The ropeway consists of 20 cabins accommodating four persons per cabin. In his address, the CM said, the public of Sikkim and particularly the people of Namchi have received an added tourism attraction in the form of this ropeway. He mentioned that the project was envisioned by the government in 2003 and further shared about hurdles faced in giving shape to this colossal project. He added that the state government consistently and vigorously pursued this massive ambition of construction of ropeway in Namchi in order to transform the South Sikkim district headquarters as a town filled with modern state of art infrastructure. Chamling stated that this ropeway will provide more opportunities to local youths and urged to take the full opportunities of these opportunities to be self-reliant. 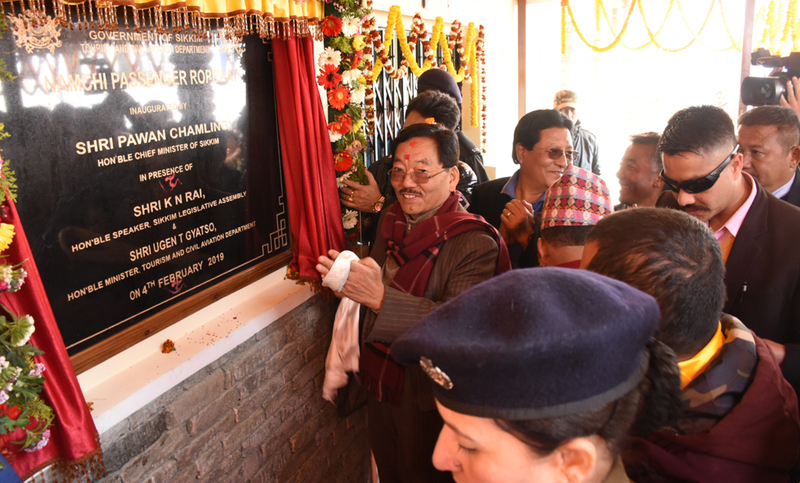 CM Chamling also inaugurated the District Veterinary Polyclinic at Boomtar Namchi in South Sikkim on Monday. This Veterinary Polyclinic has been built with a project cost of Rs 4.87 crore and is a two-storied building with four components for goatery, piggery, poultry and dairy. The beautiful and well-equipped state-of-art hospital also houses clinical examination facility for farm animals, where surgical operations and diagnostic laboratory, including x-ray and ultrasound facilities have been installed for providing modern veterinary health-care services for domestic animals. While dedicating this facility to the people of Namchi, the CM urged them to inculcate a sense of ownership and responsibility to properly maintain this clinic.